Gary's Automotive Service Center has been providing premier auto repair and maintenance services in Laurel, MD through excellence and reliability for over 30 years! Our ASE Certified Technicians are equipped with state-of-the-art diagnostic equipment to ensure your car, truck, SUV, or van is diagnosed and repaired properly and in a timely manner. We use the most advanced equipment to diagnose even the most complex problems and provide a complete and accurate estimate of the work before any repairs are performed. People come to Gary's Automotive knowing that they are going to get their vehicles repaired at a fair price, as quickly as possible, without sacrificing safety or reliability. We stand behind our auto repair and auto service work with a 36 month, 36,000 mile warranty on parts and labor. You can be confident we'll stand behind the work we do. People come to Gary's Automotive knowing that they are going to get their vehicles repaired at a fair price, as quickly as possible, without sacrificing safety or reliability. 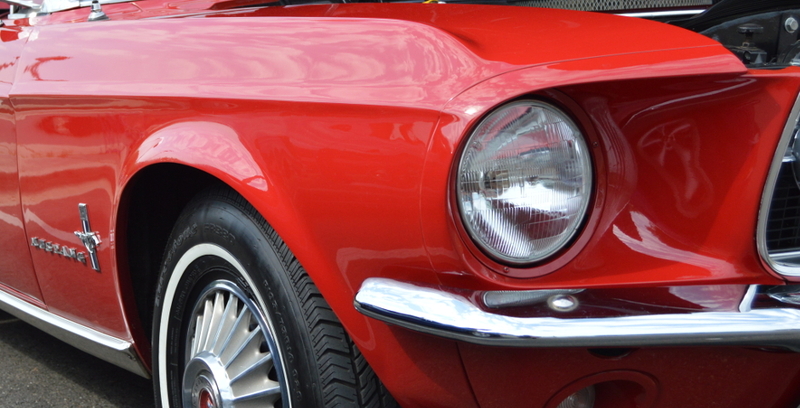 Read more about some of our most common auto repair and maintenance services. As your premier Laurel, MD Auto Repair Shop for over 28 years, the ASE certified technicians at Gary's Automotive combine the latest auto repair technology and integrity to give you a thorough diagnostic evaluation of your vehicle's performance and are equipped to perform all major and minor repairs for foreign and domestic vehicles. We are a certified NAPA Auto Care Center, and are able to provide the benefits of a well-known national organization while maintaining the personal touch of a family owned business. We understand that your vehicle is a major investment, and that is why we care for each customer’s vehicle as if it were one of our very own. Spring is sure to bring out needed car repairs again this year. It is tempting to stay inside during the cold, icy winter months even when we know it's time for an oil change. It happens to all of us. However spring comes and the time change and more sunlight has us planning trips. We all know before that trip we should have the car serviced, Oil Change, tires checked and perhaps fluids flushed when the mileage is due. 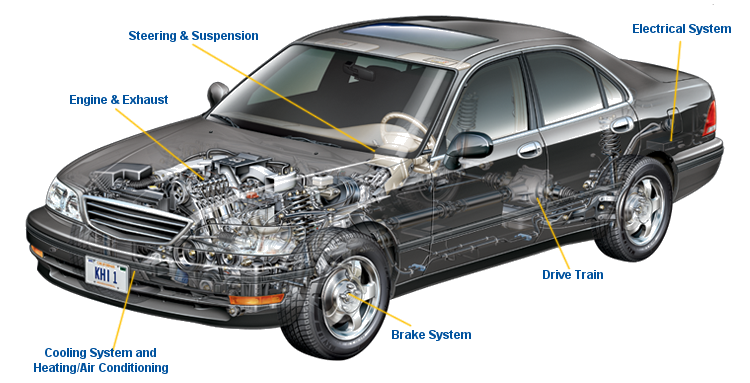 Being a trusted mechanic in Laurel, MD with ASE master technician certifications and experience that reached back into the 1980s we provide that service. 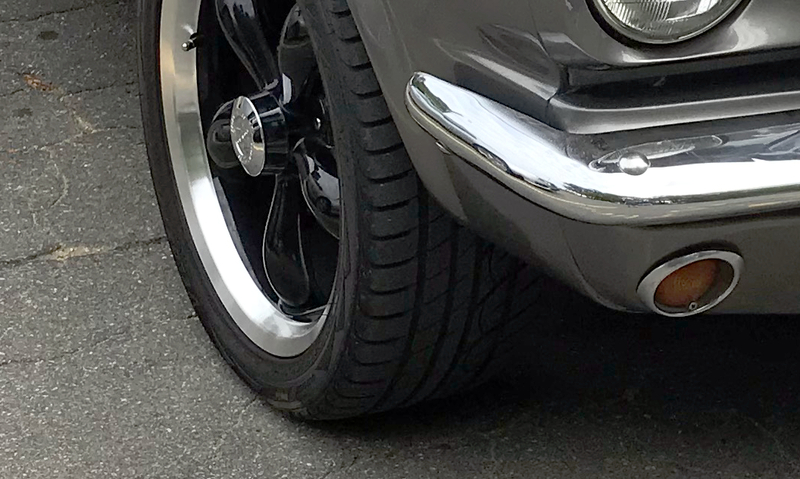 If your vehicle has been knocked out of "true" and in need of a front end alignment or a 4 wheel alignment we can perform an alignment with computerized accuracy. Our aim is to communicate clearly and help you to make informed decisions so you can keep your car or truck, SUV or other vehicles as long as you choose. If you are new to the central Maryland area and are looking for a trusted mechanic give us a call, stop by or make an appointment on-line. We'll show you our personal, professional car repair services and why we have so many 5 star reviews. While car repair can happen any time of year some repairs are more common during certain times of the year. Even the industry terms have changed. We used to be called a "Mechanic in Laurel Maryland" now we are referred to as "ASE Certified Master Technicians in Laurel, MD." And rightfully so, technology has changed and so has the level of training and equipment. It takes more skill, experience and training as the complexity has increased and the increase in sensors and computers in vehicles today. Winter can be hard on batteries, tires and brakes. The cold temps can make a battery work harder to start a car. Tires and brakes are effected by the temps as well as the chemicals used to keep roads from freezing over. An Oil Change is also important as the winter keeps all of us inside a little longer than usual. However that oil change is just as important during the cold months. Enjoy the winter months, the sights and sounds of people playing in the snow but don't neglect your vehicle. Come in to see us and save your money as your car will last longer with fewer issues over its lifespan. Winter is in full swing and so are car repairs in Laurel MD, zip code 20707. Brake repairs are the type of car repairs that should not be put off for another day. The cold weather and busy schedule may have you putting car repairs on hold, but that can cost more. We have built a great set of reviews and recommendations over the decades and that comes from honest communication. When it's time to get your brakes replaced it's important to do so. Waiting on brake repairs often means further damage. Brake rotors, pins, calipers and more can be damaged when brakes have worn. The combination of overheating and debris from metal on metal surfaces can easily damage rotors, drums and pins. This means more parts to purchase and more time to remove and replace. Like all car repairs we want you to save and be efficient. Creating a trusted relationship is healthy for everyone involved. If you are looking for an honest mechanic (aka ASE Certified Master Technician) we can help. Give us a call for all your car repairs including Brake Repair in Laurel, Disc, Drum, Emergency and Parking Brakes. With the cold weather here and the holiday season just behind us it can be tempting to put off car repairs like an oil change in Laurel. Freezing cold temperatures and less daylight keeps all of us indoors. However an oil change is one of those repair services which is so important to keeping your engine running longer with less issues. 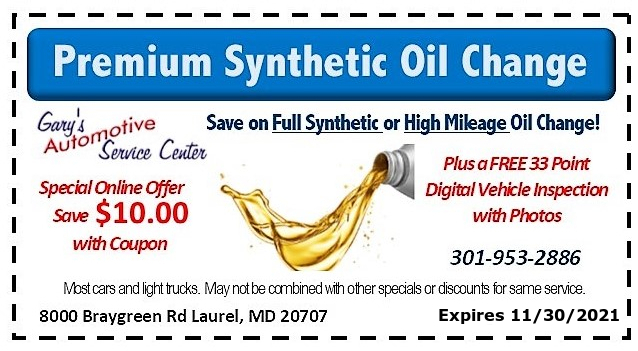 With decades of experience we can help with your Oil Changes, Standard, Synthetic, High Mileage in Laurel. It may be tempting to find a "cheap" oil change however you get a lot more when you use an ASE Certified Master Technician for your oil change. We can detect those small issues, like a loose clamp and solve it while a less experienced, uncertified, and "in a hurry" location may miss these issues. Oil Changes are perhaps the highest value of all car repairs. The importance of lubrication and reducing friction and heat will make a large difference in the life of your engine. 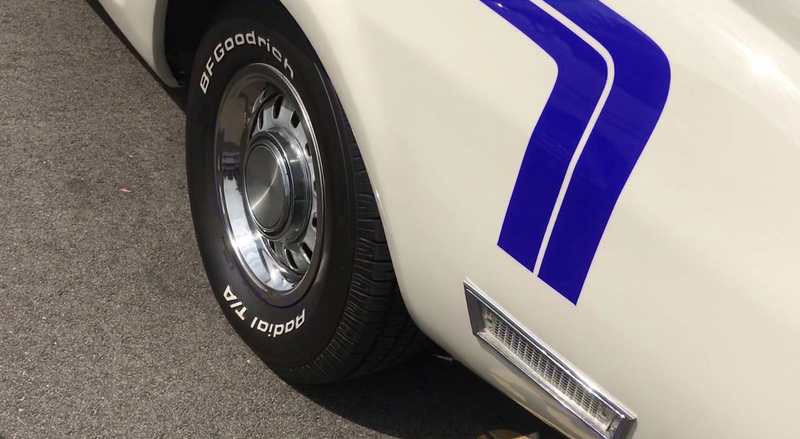 If your car is older and you are wondering if a high mileage or a synthetic oil change is best we can bring you honest, straightforward answers for your car's condition. We hope you enjoy the change of seasons and get out to see the beauty of winter snows. We can help to keep you running smoothly with all your autmotive needs in Laurel, MD, 20707 zip code. This time of year the weather can test your tires and wheels. 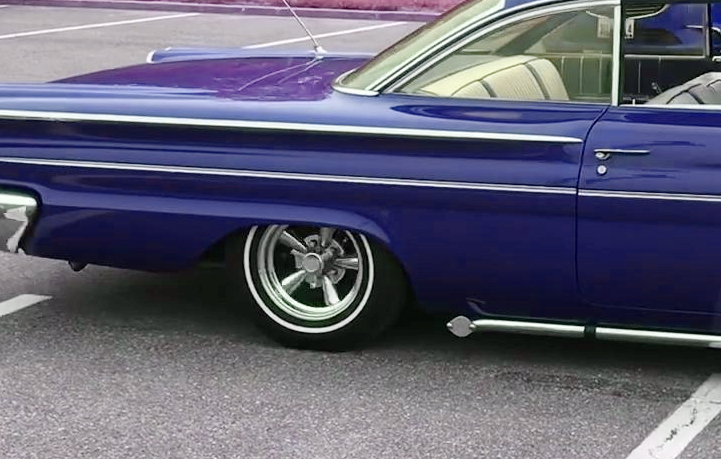 We can help with the car repairs in Laurel to keep you aligned, balanced, mounted and rotated. We sell tires as well as align your wheels. Getting more out of your tires can save money and help you stay in control when the weather turns a little slicker. While no set of tires can keep complete control when the weather turns a set of "bald" tires will have you out of control. Alignments can help with even wear of tire tread. This will help save money, time and effort. Our state of the art tire and wheel services in Laurel brings precision to your automotive needs. Tires also need precision. We invest in ASE Certifications for Master Technicians to stay ahead of the learning curve and bring you higher quality services. If your tires need rotated, replaced, balances or aligned don't hesitate to call. We are locally owned and operated and that means we know the hustle of the holiday season and how it is to be prepared for travel. Give us a call, stop by or contact us online for help with all your car repair needs in Laurel Maryland. We are proud to be the Laurel Maryland toys for tots drop off location. You can bring your new, unwrapped gift for a child. Being Locally Owned and Operated Car Repair in Laurel we are involved in the local Laurel community. Seeing those who could use a hand to have a nicer holiday season we are glad to help. Whether you think of us as trusted Mechanics or highly trained ASE Certified Master Technicians with ongoing training and testing we are glad to be connected to the people of Laurel in so many ways. One of those integral parts is giving back to the community. Seeing the smiling faces and warm hands of those who could use a hand is very rewarding. Having generations and of customers and generations of mechanics working together to build a better culture is rewarding. While we can help with all your car repairs like an oil change, brakes, state car inspections, car starter, clutch repair, check engine light, dashboard emergency and warning lights we can also help to give back to the Laurel community. 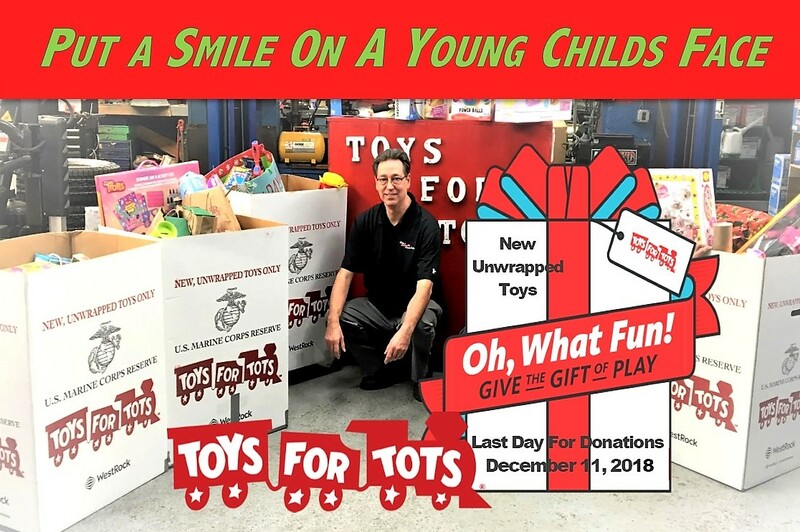 We can help to donate space and time as a Toys for Tots Donation Center in Laurel MD. You can drop off a toy, the deadline is Dec 11th, 2018, Monday through Friday 8am-6pm. We are getting into the Holiday season and that means travel for gatherings, shopping and good friends. Common car repairs in Laurel MD this time of year include brakes, we offer a lifetime brakes special oil changes, batteries and a "tune up." Tune up is a common term that we all use however the actual service has changed greatly. A tune up used to involve manual carburetors and very little electronics and no computers. Now with advances in automotive technology a tune up has changed to involve computerized components and precision analysis and repair tools. ASE Certified Master Technicians will tell you one thing that has remained is the need for spark plugs and the replacement of them. When your vehicle is running rough or poor idle, lacking the normal power when accelerating or the engine is rising and falling even when sitting still you may benefit from replacing spark plugs. If your holiday season is going to involve a little driving it may be a great time to get a little preventative maintenance. We can help with all your needed car repairs in Laurel Maryland. Autumn is here and car repairs in Laurel can help make for a smooth road trip to see the leaves changing into their autumn hues. Being locally owned and operated we notice the changes and are getting prepared for holiday trips with an oil change and brake check. Even ASE Certified Master technicians / Mechanics need to service their vehicles. A Coolant check is a great idea as the freezing temps will be here soon. Those cold reading on the thermometer will test your engine's ability to stay in the right range and protect your engine. Keeping your car's heater running and keeping you comfortable is another repair we can help with. Being prepared for the coming winter can help to reduce the stress of the holiday season. Don't forget about your car battery, we can test and replace if needed. Give us a call or make your online appointment to get all your car repairs in Laurel MD 20707.